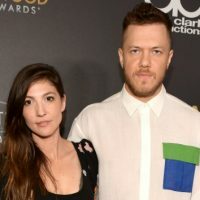 Matt Winkelmeyer/Getty Images for HFAImagine Dragons frontman Dan Reynolds and his estranged wife Aja Volkman are trying to reconcile their relationship, US Weekly reports. On November 4, Reynolds and Volkman attended the Hollywood Film Awards together in Los Angeles, where Dan’s documentary Believer was honored with the Hollywood Documentary Award. And if you need even more evidence that things are good between the two couple, Reynolds tweeted “I love Aja Volkman” on Tuesday. Reynolds and Volkman have three children: six-year-old Arrow and one-year-old twins Coco and Gia.